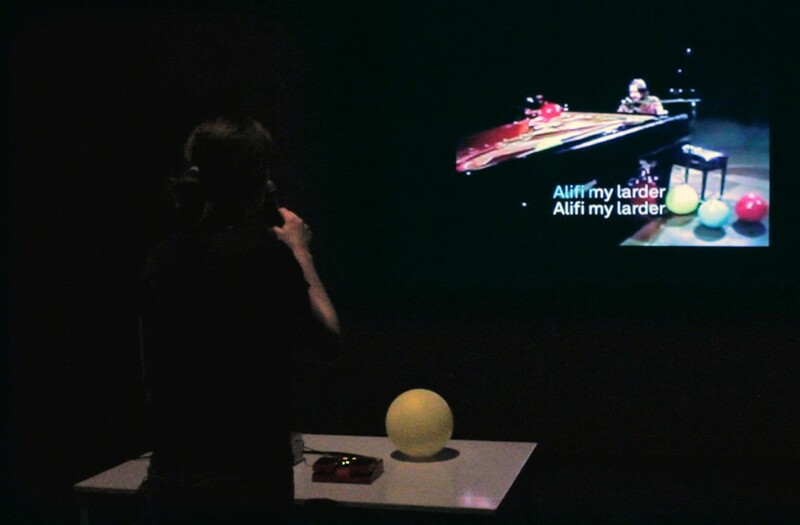 A karaoke performance piece based on a YouTube video of a live performance of the musician Robert Wyatt playing the song Alifib (Paris, 1975). It is one part of a three-part work, which also includes a multiple (KARAOKE – To W(y)att) and a monitor video work (No You). The works deal with the indistinct boundaries between self-representation and appropriation, imitation and the original, repetition and singularity, between attempt and failure. A tragi-comic study of contradictions within the self and in the given system. … I’ve come to see this form of entertainment as a bizzare, but extremely interesting cultural phenomenon. The karaoke performer is one of us, hiding as we do behind an alter ego; is an impersonator, a projection, a masquerader and – again like us – an absurdity. Hence, for me, the ideal figure to represent my conception of this strange world that we strange people live in. In my performance, attempting to imitate a musician I admire, attempting to do justice to his expressive voice, I am naturally doomed to failure. Even though the arrangement of my performance is set in an art(ifical) context, I try to give it a ‘real’ karaoke character. But at the same time, I try to reanimate the real-live performance from over thirty years ago, without actually having any further background information, apart from this badly resolved YouTube-video. However, there are subtle irritations which prompt the viewer to an awareness of deceptive appearances.